Brexit, Trump and the rise of nationalist parties in Europe put the study of inequality high on the research agenda. Mariya Hake (OeNB) shows how it affects trust in institutions. Recent election outcomes were feared but not anticipated by many researchers. The vote of the United Kingdom to leave the European Union, the vote for Donald Trump as the new president of the most powerful country in the world, the increasing popularity of nationalist parties in Europe – all these circumstances might not represent pro-Brexit, pro-Trump, or pro-nationalist but rather anti-establishment movements. People ask for change. But why? A possible candidate for explaining these developments could be inequality. Inequality has many interlinked dimensions. Inequality in income, education, health, housing. Inequality in opportunities. They strongly influence each other. Bad health is often associated with lower income. Lower income might lead to lower educational attainment and worse housing conditions. Insufficient education does not only impede job opportunities but also negatively affects health of a household. How strongly one dimension of inequality implies another dimension, and whether they persist over generations strongly depends on social and economic policies. The easiest dimension to measure is income inequality. A very popular measure is the GINI coefficient. It is a measure ranging from 0 to 100. A GINI coefficient of 0 would imply that income is equally distributed in the society. On the other hand, a GINI coefficient of 100 would mean that one person/household earns all the income of an economy, while all others do not earn anything. 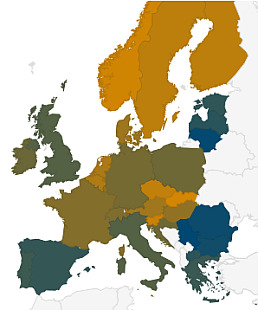 Looking at the map below, we see from the most recent data provided by Eurostat that in Europe the GINI coefficient ranges from 23.6 for Iceland to 38.2 for Serbia. Studies on income inequality either elaborate the drivers of income inequality [e.g. wiiw studies by Leitner (2016, Leitner and Stehrer (2014)] or the consequences thereof. In a study in 2015 on Member States of the European Union wiiw economist Sebastian Leitner highlights the negative impact of income inequality on population health, measured as life expectancy, infant mortality and death rates on various causes. In addition, higher income inequality is associated with earlier leave from education, higher non-activity of young people and higher rates of violent and property crime. Mariya Hake (OeNB) and Christian Belabed (OeNB) do study another possible consequence of income inequality which is of particular interest in light of current political developments as outlined above: Using data from the OeNB Euro Survey they construct regional inequality measures for Central and Eastern European (CESEE) countries. With these measures they evaluate the impact of income inequality on trust in national institutions by applying a multilevel model. They argue that trust in national institutions increases with relative income, while it decreases with higher levels of regional inequality. Main results from the study on regional income inequality and its effects on trust in institutions will be presented by Mariya Hake (OeNB) during a Seminar in International Economics on Tuesday, 6 December 2016 at 4 p.m. at wiiw (map).